…………I can’t wait to get out there! 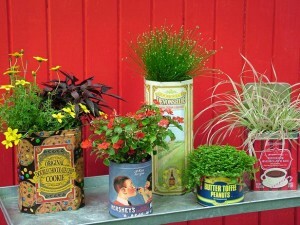 Container gardening is still one of my favorites. There is just simply no end to what can be done with something that has a hole in the top or something you can cut a hole into the top. 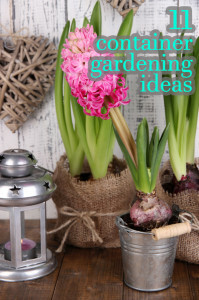 While gathering some new ideas for our early spring I came across some of the funnest ideas ever! Colorful plastic buckets grouped together on a walking path. Sun loving plants or shade lovers as well. Depends on what your path is like. 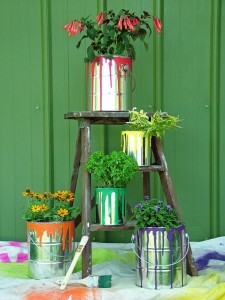 More galvanized treasures, tall and short, old and new; potted and placed on the side of a garage. Boots and shoes of all shapes and sizes. 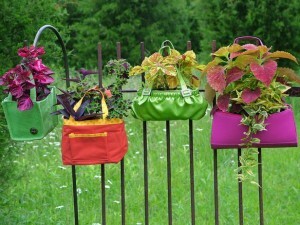 Stick a geranium in them and…voila! Benches with bushel baskets and asparagus fern. If you have an old picnic table, dress it up with plastic pitchers and tumblers. I bet you can find an old picnic basket at a thrift store. Teapots and mugs with ferns, wandering jew, and impatiens atop a round cast iron table adds whimsy to a tired corner. Drawers and an old nightstand. 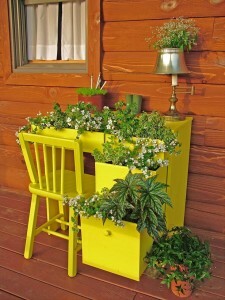 Paint a wonderfully bright chartreuse and fill with large leafed shade lovers! Adorable! If you run out of ideas and have explored HGTV for hours, just visit a thrift store, wander around and pick up anything you can stick a plant in. Look for interesting shapes, sizes, and colors. If you want a particular look or theme, gather like items. If you’re more eclectic in style choose items that don’t match but complement one another.